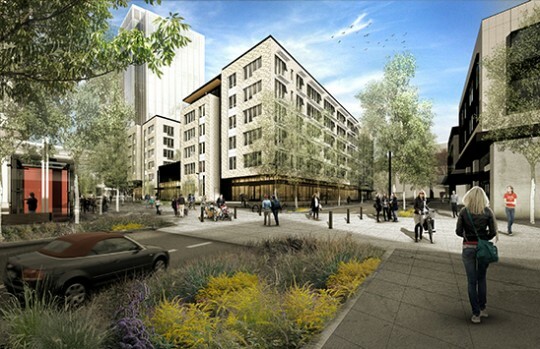 Portland, Ore. – Portland Streetcar released brand new data Thursday on the relationship between housing development and streetcar ridership, offering insight into future demand for streetcar systems around the country. In a study of housing construction and streetcar ridership over the past 15 years, ECONorthwest found that each new housing unit built along the streetcar corridor has added one new regular streetcar rider. With over 17,000 housing units built along the corridor since 2001 and another 8,000 in the pipeline in just the next two years, that adds up to a lot of riders. To accommodate increasing demand, Portland Streetcar is developing plans to add vehicles and expand the system to reach new areas of the city. This new data adds to the growing body evidence that shows streetcars support city and regional goals for both increasing mobility options and improving economic opportunity. Left turns from NW 9th Avenue onto Lovejoy Street toward the Broadway Bridge. 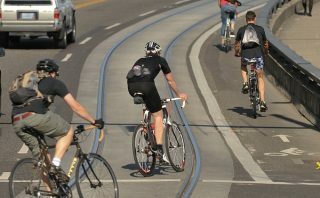 In the city with North America’s largest streetcar system, on-street rails almost rival automobiles as a factor in collisions that injure people on bikes. That’s one major finding in the first academic study in North America dedicated specifically to the danger of streetcar tracks to people biking. Among bike-related injuries in Toronto that resulted in emergency-room trips, the study found, 32 percent directly involved streetcar tracks and more than half happened on streets with streetcar tracks. 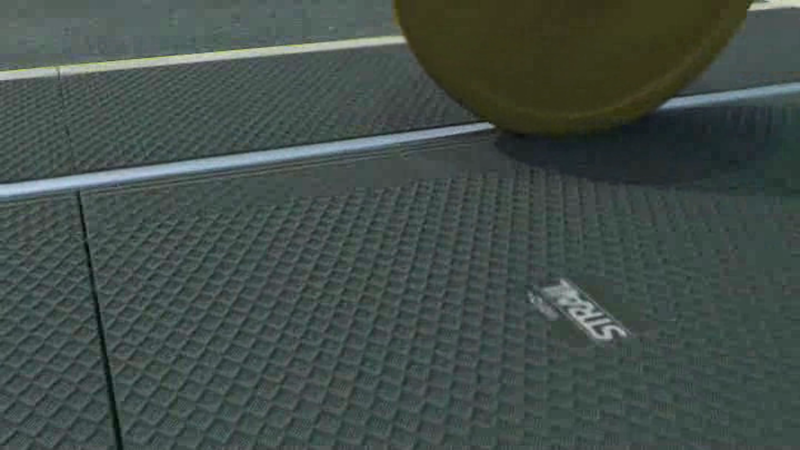 And in what lead author Kay Teschke described as “a surprise to us,” 67 percent of track-related injuries happen away from intersections. The Lloyd District’s new “bikescraper”: also a streetcarscraper. Though the experience of China, Japan and Northern Europe makes it pretty clear that you can’t have a great bike city without also having a great mass transit city, streetcars are the one transit type that seems to rankle bike-lovers. Maybe it’s the rails that turn traffic lanes dangerous for biking. Maybe it’s that streetcar projects often underinvest in adjacent bike improvements. Maybe it’s that streetcars are deeply controversial in the public transit world, too. But there’s also an argument that streetcars are actually the very best sort of public transit at improving biking. 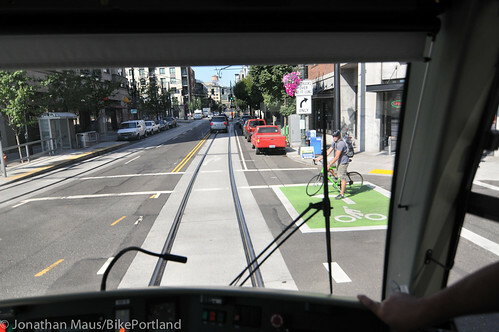 On Portland Transport Monday, local streetcar and biking fan Chris Smith laid it out. Will Portland Streetcar ever find a way to prevent bike-rail crashes? 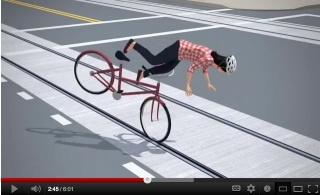 for safer urban rail crossings. Twelve years after Portland Streetcar added its rails to city streets, it’s still a Portland rite of passage to crash your bike on its tracks — and it’s still a maddening problem for the handful of people trying to solve it. MacNichol, who occasionally researches the issue on his own time, said he’s currently hoping for an email reply from veloSTRAIL, a German company that makes plastic inserts for urban rail crossings designed to collapse beneath a streetcar wheel but not beneath a bike. But veloSTRAIL, he said, seems to be designed for T-shaped ballasted tracks — not the C-shaped girder rail used by Streetcar. Get free rides during next week’s closure. 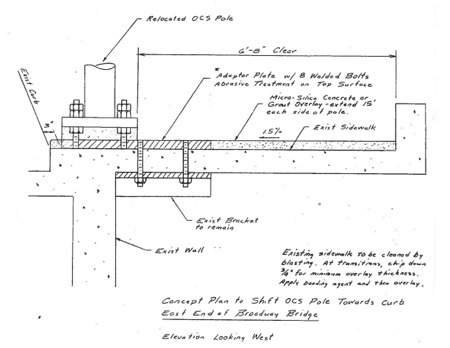 The impending closure of the sidepaths on the Broadway Bridge next week has started a lot of discussions about how the Bureau of Transportation (PBOT) handles traffic mitigation during construction. We have reported on the bicycling aspect of the closure; but many people are now realizing that it’s people who usually walk across the bridge that will most impacted. 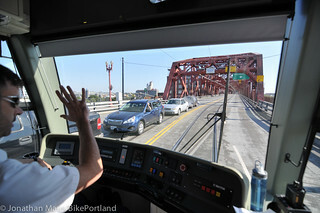 Unlike people riding bikes, they are highly unlikely to simply take the lane and the detour over to the Steel Bridge is likely a deal-breaker for those on foot. Still from “When I Ride” video. With the big grand opening of the new eastside/central city loop extension of the streetcar being this weekend, Portland Streetcar Inc. (PSI) has just unveiled a new safety video. 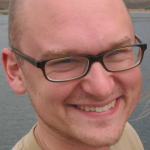 The video features (and is narrated by) Bicycle Transportation Alliance (BTA) Advocacy Director Gerik Kranksy; but it doesn’t just focus on bicycling. Titled, “When I Ride,” the video is made for all road users, from skateboarders to walkers and even drivers. I got a new view of the Pearl District today from inside the yet-to-be-opened eastside streetcar line. Today, I’m celebrating, because it looks like we’re going to be able to move a streetcar catenary pole (a pole that holds up the overhead wires) that has been impinging into the bike facility on the Broadway Bridge since this summer. But I want to be clear about what I’m celebrating. I’m not celebrating a win for cyclists over streetcar. That would be the wrong lesson to take from this. I’m celebrating the ability of people of good will who don’t always share the same perspective to work together to achieve good outcomes (Congress, take note). This was not simple, and for a while I thought there might be no feasible way to move the pole, which is why, in conjunction with the BTA, I put a formal request for mitigation on the table as an alternative (download a PDF of that request here). So how are we going to do it? 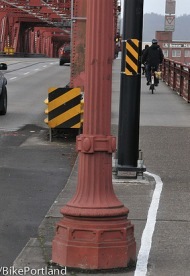 The key challenge (acknowledged by a number of folks here in the BikePortland discussion who have looked at the bridge structure) is that the structural foundation for the pole is constrained by where the edge of the bridge structure is. The answer is to use the same foundation bracket, but then shift the pole horizontally from the anchor by a little bit (it will be more in ‘the shadow’ of the street-light pole on the sidewalk). A number of folks noted that a similar “cantilevered” approach was used on poles on Weidler. In this case, the sidewalk is much more shallow. 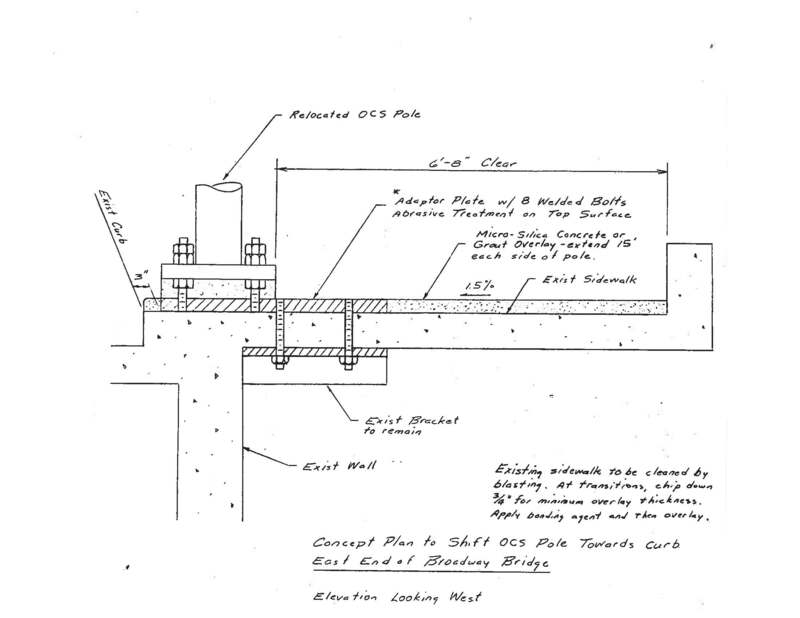 So instead of the large brackets used on Weidler, we’ll use a 2-inch thick metal plate with welded bolts (see diagram below). Diagram of new pole location. The thin plate will sit on the surface of the existing the sidewalk. So we will need to increase the sidewalk height to match. This will require tapering the sidewalk gradually over a number of feet east and west of the pole. The plate itself will be flush with the new sidewalk grade and textured to keep it safe for people walking and cycling over it. Because the pole will now be much closer to the curb than standards provide for, we will need to place a bollard in front of the pole. This is to protect the pole if an auto ever jumped the curb. But the bollard will also be in line with the existing light pole, so it does not reduce the usable path. But we’re not done yet. No good deed goes unpunished. Because we’re raising the grade of the sidewalk, the railing on the river side of the sidewalk will no longer be tall enough above the sidewalk surface to meet standards. So we will fabricate and attach an extension to the railing on the two sections nearest the pole. Because of the extensive modification of the sidewalk adjacent to the pole and bracket, we’ll need to close the north sidewalk for about two weeks. The work will be funded from the Streetcar Loop project budget. I’d like to thank my colleagues at Portland Streetcar who were willing to keep looking for solutions, ultimately threading the needle through all the constraints and regulations, and the members of the community who helped keep focus on the need to address this issue. 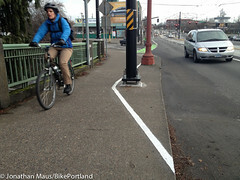 Together we’ll keeping making Portland a better place for users of all modes of active transportation. The pole has narrowed the busy entrance onto the Broadway Bridge.